Join the BC SUPPORT Unit’s very first Tweetchat! 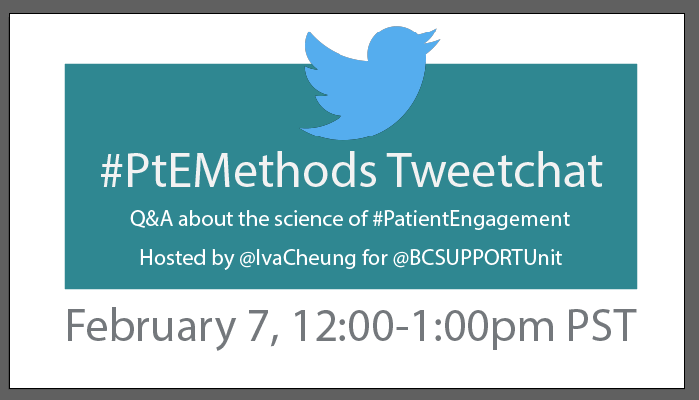 Guest host Iva Cheung will be tweeting from @BCSUPPORTUnit on February 7, from 12:00 – 1:00 p.m., to encourage diverse attendees in the Twitterverse to explore the science of patient engagement. We’ll be using the hashtag #PtEMethods as we go on our first Tweetchat journey together.